Figure 2. Localized yellowing and stunting of wheat. Figure 3. Close-up of an area with stunted and yellow wheat. Figure 4. Mosaic and yellowing on leaves caused by wheat soilborne mosaic. Fruiting structures of the Septoria leaf blotch fungus and yellowing of lower leaves caused by the disease. 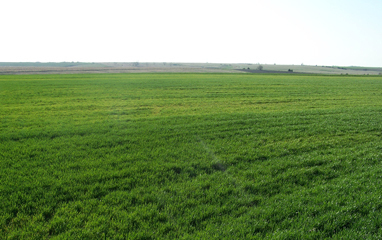 Some wheat fields are showing areas with yellow and stunted wheat. 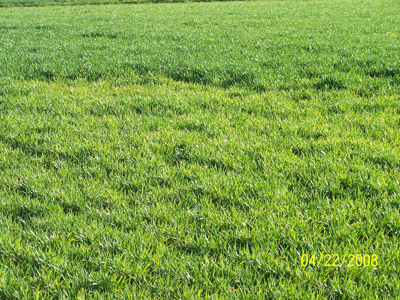 Symptoms are showing over large areas in some fields (Figure 1), but are localized in other fields (Figure 2). When this condition occurs early in the growing season, it is most likely due to wheat soilborne mosaic virus. UNL's Plant and Pest Diagnostic Clinic has confirmed the virus in wheat samples from south central and eastern Nebraska. Wheat soilborne mosaic virus causes stunting (Figure 3) and a mosaic (patterns of dark and light green to yellow) on leaves (Figure 4). Severe stunting (rosetting) can occur in highly susceptible cultivars. 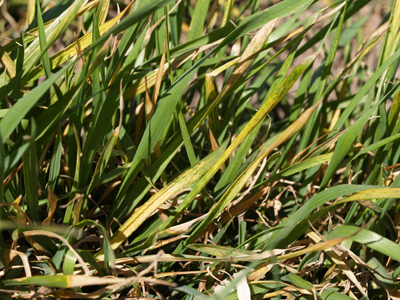 The virus primarily infects winter wheat, but spring wheat also can be infected. 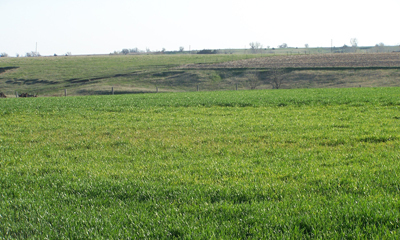 In winter wheat, infections causing the most damage occur in the fall during wet, cool periods. The virus survives in soil in association with resting spores of a root-infecting fungus, Polymyxa graminis. This fungus preferentially inhabits low-lying wet areas, but can occur in flat areas as well. The resting spores of the fungus germinate by forming spores known as zoospores which swim in wet soil and infect root hairs, transmitting wheat soilborne mosaic virus in the process. Wheat soilborne mosaic is favored by wet soils and a temperature range of 50 to 68°F with an optimum of 61°F. Symptoms are mild and the disease will not progress when temperatures are above 68°F. Wheat soilborne mosaic can be managed by planting resistant cultivars and avoiding planting earlier than the recommended date for your area. 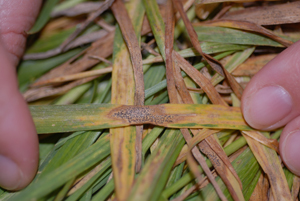 The Plant and Pest Diagnostic Clinic also found other wheat diseases in recent samples, including leaf spots on the lower leaves, mainly caused by Septoria leaf blotch (Figure 5). These leaf spots also can cause leaf yellowing, but not a mosaic or stunting. Leaf spots can be controlled with a fungicide application which should be timed to protect the flag leaf.